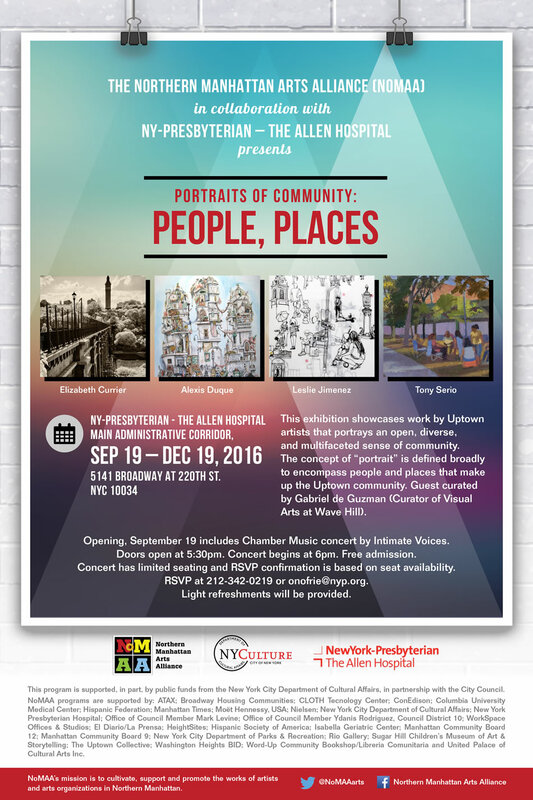 The Northern Manhattan Arts Alliance (NoMAA), in collaboration with NewYork–Presbyterian – The Allen Hospital, presents Portraits of Community: People, Places. 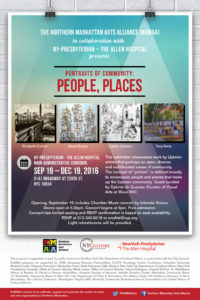 This exhibition showcases work by four Uptown artists that portrays an open, diverse, and multifaceted sense of community. The concept of “portrait” is defined broadly to encompass people and places that make up the Uptown community. Guest curated by Gabriel de Guzman, Curator of Visual Arts at Wave Hill. Opening: 19 September 2016. The opening includes a chamber music concert by Intimate Voices. Doors open at 5:30pm. Concert begins at 6pm. FREE admission. RSVP at +1 212 342-0219 or by email. Light refreshments will be provided. Please Share and Like this!